Written by Adii Pienaar on July 25, 2018 Blog, How to sell online, Marketing. Social proof from other people who’ve bought your products breeds trust, and often nudges customers across the finish line to make that purchase. One of the best ways for eCommerce merchants to build social proof is through product reviews or ratings, which 88% of consumers say influence their buying decisions. WooCommerce makes it super-easy for you to use product reviews and display these on your website, which is great for conversion. But what happens once website visitors leave your website? Most of your prospects (and often, customers) will never see your reviews again. Your cart abandonment emails are an opportunity for re-marketing — a second chance for you to persuade someone to make a purchase. Why not want use all your sales and marketing assets? Tell your prospects that they left highly-rated products in their shopping cart. Using the star rating of the highest rated product in their cart in your subject line (e.g., “You left some ★★★★★ products in your cart!”) will boost your open rates greatly. Most abandoned cart emails contain a list of the products left behind in the cart with basics like image an of the product, the product name, and the price. Including the number of reviews and average rating here makes that product much more compelling. When you see something like “Rating: 4.71/5 (67 Reviews)” you get an instant shot of FOMO that makes you think twice about not completing this purchase. Does this work? I implemented this on my wife’s store and within the first month, we saw a 36% increase in her recovery rate. Along with re-marketing, abandoned cart emails are another opportunity to sell your customers on your products. The biggest challenge with automated email re-marketing is that it can seem a little generic. Consider that many online shoppers practice a digital version of window shopping where they will browse a website and add multiple products that seem interesting to their cart. They’re only adding them for further consideration, and may not have the same purchasing intent for all products. Most cart abandonment emails will re-sell all of those products equally, overwhelming your prospect and diluting your re-marketing and reselling efforts. Instead of trying to sell every product in the abandoned cart, highlight the single product that you believe the prospect is most likely to purchase. The easiest way to do this is to focus on the most popular/best-selling/highest rated product in their cart. If you want to get really smart, you can use a recommendation algorithm that also considers the customer’s past browsing and/or purchasing behavior. The current state of abandoned cart re-marketing campaigns likely means that your customers have come to expect that emails will include a discount coupon. This will be especially true of loyal customers who make frequent purchases, which is not ideal. Your most loyal customers generally don’t require as much persuasion as a first-time buyer; you don’t need to sacrifice part of your gross profit by issuing a discount to your loyal customers. Instead, use a loyalty/rewards program, then remind your best customers of their points balance and that they can use those points towards their purchase. The effect for the customer is the same (i.e., a discount), but you only pay in the form of the accumulated points that they can redeem instead of issuing a new discount. 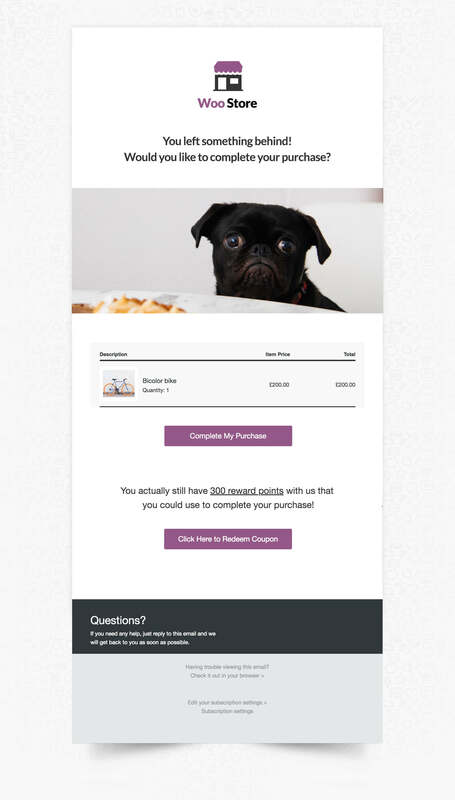 Segment your cart abandonment emails so that your most loyal customers gets a different re-marketing sequence. The easiest way is to create a segment with criteria for “Points. Balance that exceeds X” (where X number of points would represent at least a 5% to 10% discount if redeemed). In emails themselves, highlight their points balance and remind them that they can redeem it for the order that they abandoned. I expected this to work well, but the results have exceeded all expectations. Recovered revenue per email increased six-fold compared to the merchant’s previous sequence for repeat customers (it also has 12x better recovered revenue per email when compared to first-time buyers). You can also remind customers how many points they need to reach the next tier of your rewards program. Fo example, if they complete this purchase for $100, they’ll earn 500 points and unlock the next tier’s benefits. The introduction of the GDPR has highlighted the need for consent, which confirms something that email marketers have also known for a while: the customers that want to hear from you and give their consent to receive your (marketing) emails will always be the most engaged. Most abandoned cart sequences includes three or four emails at most, sent over the span of a couple of days. When that sequence ends, the opportunity to build a relationship with a prospect also ends because you only had consent to email the customer about their abandoned cart. The problem is that timing is often a critical factor in a customer making a purchase. Perhaps they were shopping for a gift that they only need next month. Or they don’t have the money to spend right now and have to save up first. The customer may actually have had a really strong purchasing intent and it was only the timing that prevented them from making the purchase. To increase your recovery rate indirectly, move these prospects to a longer-term nurturing campaign. Start with additional email at the end of your existing email sequence that asking whether they would like to subscribe to your newsletter. 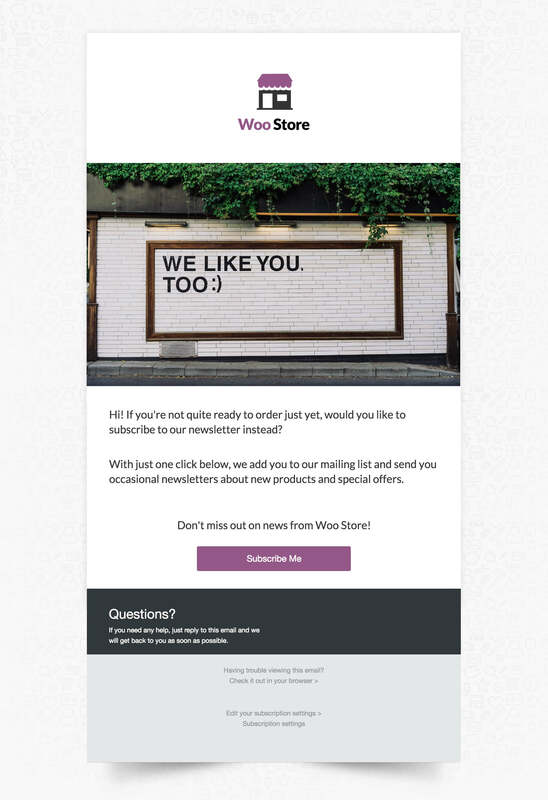 Once they give you that consent, you can either trigger an automated follow-up or drip campaign (this is how we would do it using Conversio) to tell them more about your brand, or send them periodic newsletters announcing new promotions or products. This keeps your brand top of mind for a purchase when the timing makes more sense for them. Email continues to be a very stable, reliable, and scalable medium. And while everyone expects email will eventually die, it remains an integral part of digital communications. Go old school: the telephone. While this is not a scalable tactic, it’s a high-value one. If you can get customers over the phone, you are able to respond to their objections and persuade them in a way that no automated tool can. Tools like Shoelace helps you create smart, retargeting ads on Facebook and Instagram that work alongside your email campaigns, so you’re using similar messaging and discounts in both your email and ad campaigns. Facebook Messenger’s usage adoption continues to grow and many consumers prefer Messenger over email for communication. If that is the case for some of your customers, a tool like Recart can help you leverage Messenger to recover more of your carts. First, think about how you can differentiate your cart abandonment emails just a little. Where are you exclusively using tried-and-tested methods? Where can you introduce something a little bit different and newer that will help you stand out from the crowd? 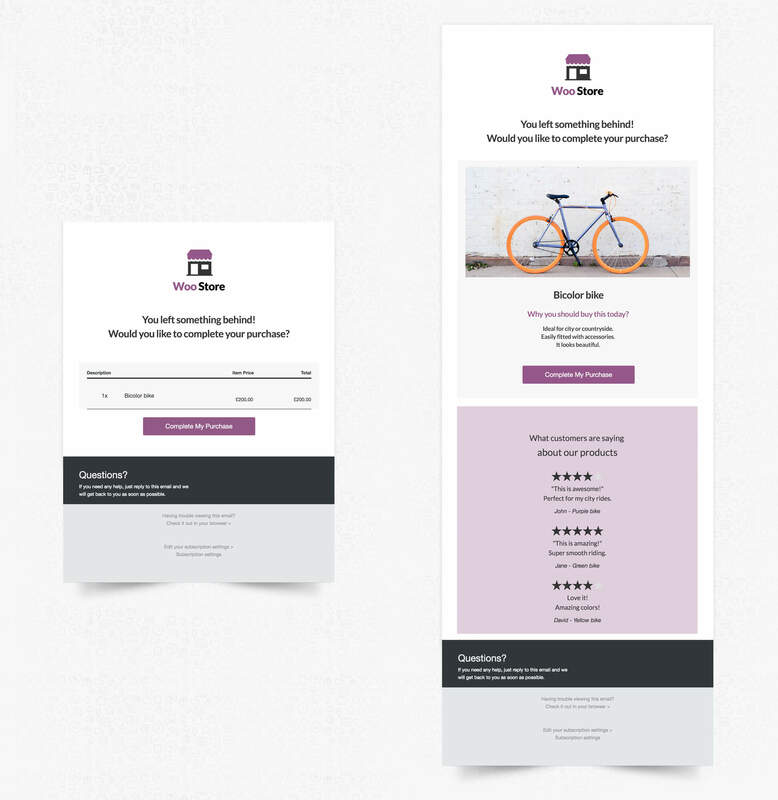 Next, consider your email marketing solution… Is it connected to your other marketing apps too? Can you use your product reviews in your emails? Is it connected to your loyalty / rewards program? If not, is there a way to connect these, either with native integrations or with a tool like Zapier? Finally, is there another medium that you can experiment with? If you like talking to your customers, try phoning your customers. Or if you’re already doing well on Facebook ads, try a better ad retargeting solution. Good luck! And let us know in the comments how you fare. Sending coupon/discount code is also a great way to retain the buyer who left item on cart. @Sumit – Yes, discounts work well. The only problem is that customers expect discounts these days and that they don’t work as effectively as before. When you use a clever discounting strategy alongside some of the things we have mentioned above though, you can definitely see a boost in your recovery rate. Was finding for a step by step guide on this and found exactly what i was hoping for. Thanks Adii. If you boost up your cart recovery rate, then you will substantially increase your profits. Your tips are spot on and I’ve used them myself in the past with great results, so for anyone reading this, I encourage you to do what Adii suggests here, because it works! Can you please explain how this process would be GDPR compliant?